New York architect Peter Marino has completed the new flagship Louis Vuitton Maison on London's Bond Street, featuring glass windows lined with golden chainmail. Louis Vuitton will open the New Bond Street Maison in London on 28th May 2010. This is the most important date in Louis Vuitton's 125-year association with London. The opening of the New Bond Street Maison gives a home perfectly attuned to the new twenty-first century mood of a place that Louis Vuitton president Yves Carcelle describes as "one of the most important fashion and cultural cities in the world. It brings together innovation, heritage and fashion – all values that are important to Louis Vuitton." The New Bond Street Maison ranges over three floors and encompasses 1500 square metres of retail space at the junction of New Bond Street and Clifford Street. The New Bond Street Maison will be the most luxurious Louis Vuitton store to date, worldwide. Its launch will be, in the words of M. Carcelle, "Opening a Maison in London is an expression of our belief and optimism in the future of the luxury industry in this city and Europe, and it also reflects Louis Vuitton’s philosophy on its cultural commitments as well as on social responsibility". 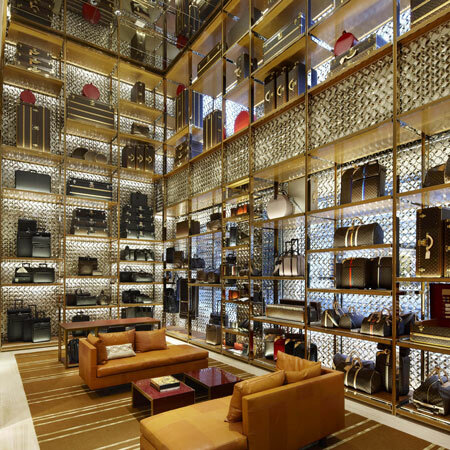 To design the project, Louis Vuitton enlisted New York-based architect Peter Marino, who has worked on previous Louis Vuitton stores including the Champs-Elysées Maison, and is a prime exponent of the house codes in physical terms. His masterplan for the site was for it to be exceptionally luxurious, both open, light and welcoming but intimate and easy to navigate with different areas and levels on each floor, allowing the customer to browse seamlessly from one area to another. His vision is to enter the Louis Vuitton world from the street outside over a bridge giving views of a dramatic glass staircase with 23 square meters of glass tread surface including LEDs to show frequently-changing film and artistic animations that take you from the lower ground right up to the first floor. Glass stairs to the lower ground floor open the way to the men's universe, at the centre of which is the men's club area where customers and their guests can relax. The store's second floor is a separate, luxurious world - the private client suite, which can only be accessed by invitation.